I am a steel cut oatmeal fanatic. Perhaps you remember my Overnight Steel Cut Oats post from last year or my Coconut Milk Overnight Oats post from last month? 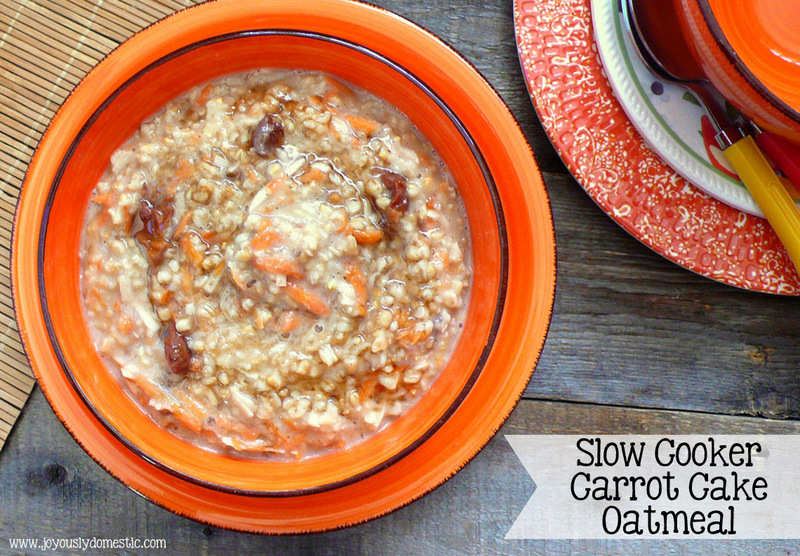 Cooking oatmeal overnight in the slow cooker allows us to wake up to breakfast completely ready. Since my hubby gets up and leaves for work usually before the rest of us are up, he can grab some to take with him on the road. Then, the rest of us can enjoy a hot, hearty breakfast as we trickle out of bed to get ready for the day shortly thereafter. This recipe is a clever take on traditional overnight oatmeal. It has all of the goodness of oatmeal, but with the fabulous flavors reminiscent of a carrot cake. (P.S. It's a great way to sneak some veggies into your kids' breakfast without them probably even minding. Bonus!) This doesn't come out of the slow cooker super sweet, so add in some additional brown sugar or even honey at time of service if you desire a sweeter oatmeal. And, if you have leftovers, this keeps well in the fridge throughout the week to reheat. Yields 4 - 6 servings (about 6 cups of cooked oatmeal). Set a bread loaf pan (I use a metal one) down into the insert of a six-quart oval slow cooker. (It's fine if your loaf pan doesn't touch the bottom of the insert.) If it is wobbly, use a crumpled up piece of foil underneath to help level the pan. Add about 2 cups of hot water to the bottom of the slow cooker to create a water bath. Add all of the ingredients (minus the topping suggestions) into the bread loaf pan. Gently stir. Lid and cook for either 8 - 9 hours on the warm setting or for 5 - 6 hours on the low setting. Serve with any of the topping suggestions you prefer. NOTE: If you double the recipe, it will be too much to fit into a loaf pan. You would have to cook everything directly in your insert. If doing so, I recommend spraying the insert with non-stick spray. Recipe adapted from Rachel Cooks.